Walkers on Arran are spoilt for choice. Goatfell is Arran’s highest point, the views from the top can be spectacular and there are many more fine hills and ridges to explore. The 100km Coastal Way is a great iconic walk which can be attempted in manageable stages or over a several days. 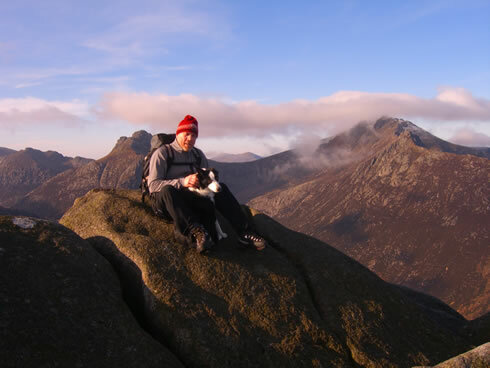 If you wish to hire a qualified mountain guide please see Arran Wild Walks or maybe join the Mountain Festival. Always be prepared - Weather on Arran can be very unpredictable. Arran Mountain Rescue Team is called out too frequently! Arran is particularly well suited to all abilities of Nordic Walking and trail running, just come along and join in, the locals are very friendly! Arran is full of wild natural bike trails, there's so much to explore in stunning mountain and coastal scenery. The trails here have evolved over time, unlike most bike centres they are not man made. There’s plenty to choose from too - gentle forest roads to steep technical single tracks. Arran Bike Club website has plenty of maps and trail information as well as timetables for their next rides. Arran roads are quiet apart from in Brodick when the boat comes in. The further you venture away from Brodick the quieter it becomes. The roads are narrow and can be a little bumpy so take your time. In every other direction you will meet a climb- but for every up there’s a down! You will be rewarded with staggering views. Bikes can be hired from a variety of businesses on the island including Arran Bike Hire and Arran Adventure. There’s something very special about playing golf on Arran. We have 7 courses all very different not only in terrain and landscape but also in the number of holes- 18, 9 or even 12- take your pick! All will give you a warm welcome, and remind you of the time when golf was fun. The Brodick course is just a few minutes walk away from Woodlea. Enjoy the mountain and sea views under the watchful eye of Brodick Castle. 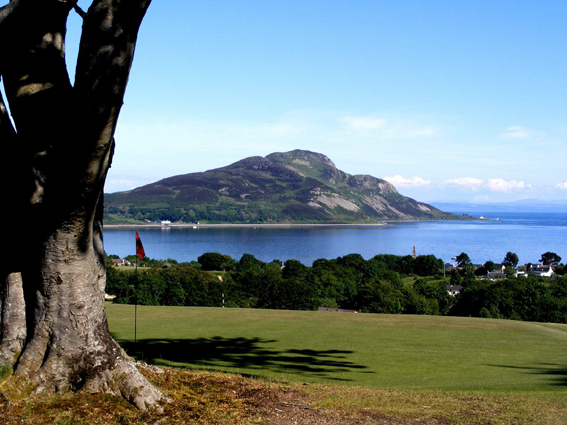 Theres lots of information at Golf on Arran including details on the Arran Golf Pass which allows one round of golf at each course giving up to 20% discount. The ASpa at Auchrannie along with the sports hall and swimming pool are open to the public most of the day. There’s pony trekking in North Sannox and here’s a riding centre at Blackwaterfoot. 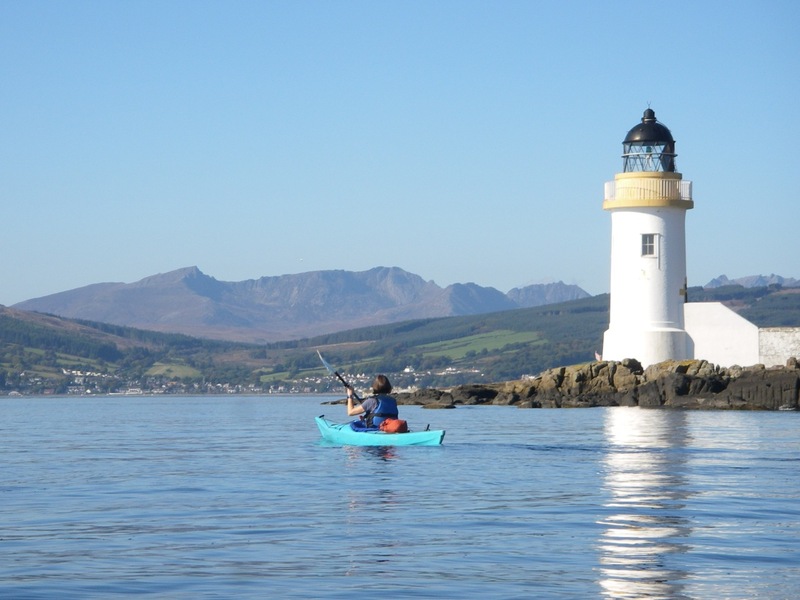 Arran Adventure offer gorge walking, skegway, archery, mountian bike guiding and kayaking. Why not try paragliding with Flying Fever see Arran from a different perspective. Arran Wild Walks provide wildlife watching tours or try the Mogabout which will take you into areas usually inaccessible by 4 wheels. For high adrenaline without much effort try the rib rides at Ocean Breeze Ocean Breeze in Lamlash. The trip out to Pladda is memorable, the birdlife is completely breathtaking with puffins and gannets flying all around the boat. Arran Birds of Prey gives you a taste of flying birds of prey. We have the Scottish Hawking Club stay with us at the end of September, their birds rest in our garden at the end of the day, it’s an incredible sight to be so close to such mighty birds. Fishing permits are required to fish on Arran’s rivers these can be obtained at the Tourist Office in Brodick. Some of the activities can be very popular so it is better to book in advance of your stay. There are many interesting early settlements on the island, some dating back to the bronze age. The most impressive is Machrie Moor with it’s stone circle and burial chamber. Legend also has it that Robert the Bruce sheltered on the island while fleeing his enemies. The King’s Cave is apparently where he was inspired by the efforts of a small spider. Arran's Geology is fascinating, we have the highland fault line running across the island and Hutton discovered his first Unconformity near Lochranza in 1787.